A winery restaurant in McLaren Vale deserving of its two chef hats, an absolute must visit! Situated at the end of a country road, d’Arrys Verandah overlooks the picturesque scenery that McLaren Vale has to offer. The beautiful vineyards of d’Arenberg help create a relaxing and serene atmosphere to ingest amazing food. Sitting adjacent to d’Arenberg winery, d’Arrys has both outdoor and indoor seating, which allows diners to enjoy the sun in good weather. Unfortunately, as we weren’t aware we needed to request outdoor seating, we were left with only indoor options. As the restaurant was bustling with the sounds of people eating and the aroma of the food being served, where we sat was the least of our worries! Inside, the white brick walls were lined with framed illustrations and glass windows made up majority of the structure – so we were able to look outside to the sunny blue skies and the lush green hills. As we sat down, we found our eyes following all the passing dishes, making us salivate before even having a chance to look at the menu! We were starving by this point, we had to order…now. And thus begins the problem of our eyes being way too big for our stomachs. Waitresses would serve dishes, clean up plates along the way and fill up water glasses where needed. As it was such a busy restaurant, with the amount of dishes that were coming out, this was an efficient way of going about it – it was especially impressive as our orders weren’t messed up at all (considering how much we did order)! Everyone who helped us out was cheerful and pleasant, which put us in a really good mood and extremely excited for the food, it really didn’t help that we received constant reminders of how amazing the food looked. Surely we were drooling so much, the waitresses didn’t even need to bother topping up our water glasses – we could have easily filled it up ourselves! The fresh bread came first and was amazing. Crusty on the outside and oh so soft in the middle. The salt crusted butter was smooth and fluffy, it looked and tasted fantastic with the bread. As the bread and butter came out on a hot plate, the butter was melting as you were eating, ensuring the butter would always be soft – which was a great touch! After indulging in some fresh bread, the waitress then came over with a large wooden board with 6 big, juicy, meaty oysters. 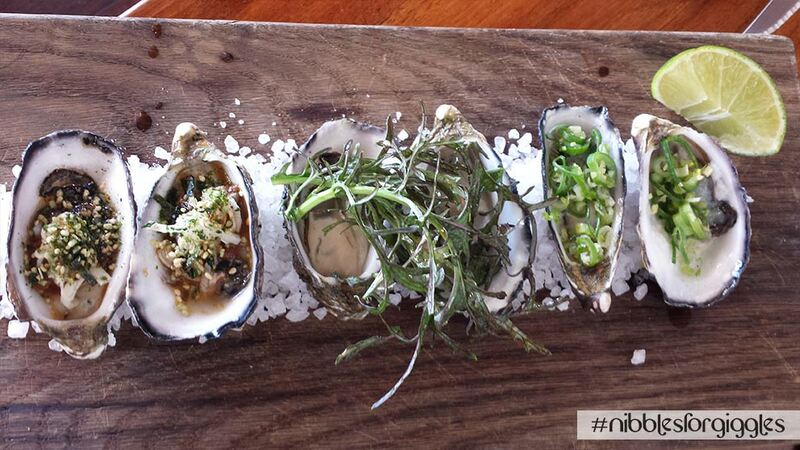 There wasn’t a small oyster in sight – we were in seafood heaven! All 3 variations worked great and as the oysters seemed super fresh, we finished all 6 with massive grins on our faces. The pork croquettes were next and the food just seemed to be getting better with each dish. As you bit into the croquette, you were greeted with a crisp crunchiness of the batter and then further acquainted with the smooth, creamy texture of the pork filling – we were salivating as we ate this delight! The accompanying salad was refreshing and sweet, complimenting the rich, salty flavours of the croquette, there was no way we could get sick of this dish. We were super pleased by now…if the entrees were this good, how good will the mains be? The steak and the duck came out relatively quickly, with both dishes looking superb. The variation of textures that the fillet steak offered was like experiencing a party in your mouth, it was unbelievable! The steak was cooked perfectly as asked and recommended by the waitress – medium rare – and just melted away as it entered your mouth. The grainy mustard was just right, not overpowering the taste of the fine meat which steak sauces tend to do sometimes. The creamed stilton spinach and parsnip and potato cake worked together to create a harmonious balance of creaminess and crispiness about the whole dish. For blue cheese lovers, there was a small bit of blue cheese which you can cut and eat with your steak too – yum! The confit duck and seared breast was almost as good – the duck was just slightly overdone but this would be serious nitpicking to a dish which was superb, just like the steak. The spiced pear brought a sweetness to the dish which complimented the bitterness of the brussell sprouts which we thought was great – seeing as brussell sprouts can often be unpleasant when had on its own. The parmesan polenta added something a little different in flavour and in texture. We were quite full at this point but didn’t want to stop, we just couldn’t! Every dish had been fantastic so it became an obligation to try every course. So, obviously the next step – we ordered dessert and a cheese board. The soft centred chocolate pudding was a taste sensation – it was, if we dared to say, a chocoholic’s dream! As we sliced open the chocolate pudding, the runny and gooey insides just twinkled at us, pleading us to bite into it right this second. If it insisted – we had to eat it. As we took in the first spoonful, we were overcome with surprise and excitement to discover there was popping candy hidden within the cocoa powder which was sprinkled over the pudding. Imagine what a joyful experience it was, our mouths crackling away as we took in the velvety, luscious chocolate ice cream, the rich Aero pieces and of course – the beautifully soft centred chocolate pudding. This, my friends, hands down could very well be the best dessert we have tried…ever! We were pretty full by this point, but with cheese being amongst one of our favourite luxuries, we couldn’t pass it up. Again, d’Arrys just knows how to do it right, each element on the platter worked so well together. The dry crackers enhanced the creaminess of the brie and the sweetness of the apple chips and apple chutney allowed us to keep inhaling the richness of the brie. We were delighted by the selection – but unfortunately, our stomachs had to tell our eyes that enough was enough. We were gutted with one whole slice of brie leftover and half its components still sitting on the board. Fortunately for us, we were able to take these home with us – d’Arrys had kindly placed it in a take-away container with food safety instructions, a well thought out addition to the food and service. This was a quite superb lunch. The only fault to be found was a slightly overcooked duck breast, apart from that the food was exquisite. Perhaps a little better ambiance in the restaurant might also help, but, from a pure food perspective, one of the best restaurants we have ever eaten at. Every single dish was thought out and put together so well – every bite we had, was an explosion of goodness in our mouths. If you are ever in Adelaide a trip to d’Arrys Verandah for lunch is a must! To date, d’Arrys has come out with the best chocolate pudding we have ever experienced! Which eatery has provided you with an unforgettable dessert? What is it and should we review it? Let us know in the comments below! That chocolate pudding does look very good! it tasted even better than it looked wattwurmnashi! I would definitely love to try!